How I spend way too much of my day. If I ever jump ship, it will be because of a product with a similar features set that allows me to control when it syncs. I've tried every combination of settings for syncing, yet as soon as I try to do something in EN, it decides that now would be the perfect time to sync. Spent 5 minutes trying to type a sentence. Came here to waste time until it finishes. Well, I stumbled across the super secret Optimize Database command in another thread and ran it. Been about 12 hours now and I haven't had Not Responding once. I still the sync spinning when I go active for a few seconds, but it's not hosing up the system. I'll probably try some of the other options under the hidden tools menu when I have time to let it run. Optimize Database took several hours to run. Meanwhile, I just used the web version, which, I have to say is not a great substitute. It does all the major things well, but a lot of minor things, such as word count in a note and note manipulation or missing or hard to find. I did spend several hours with OneNote and Nimbus. Either would make a viable alternative if Evernote continues to have problems and the management team continues to stay silent and updates don't get rolled out with fixes. You can try this firewall block - https://www.evernote.com/shard/s186/sh/ec05ed88-ae37-457d-b188-399615a71449/00e5278c5643d9fe. Fairly easy to set up. Works well stopping ALL syncing, you can adjust the time block. I created one for five minutes in addition to the one defined in the write up. That way when I know I am going to be doing extensive editing in a note I can fire it up for a brief period. Can't argue with any of that. I have EN running all the time with a 5 minute sync cycle and instant sync, so not may issues when I pop in and out. Nor do I have any slowdowns. Only time I might get one is when I am doing a lot of editing in a note. When that occurs, I double click the 5 minute hiatus bat file on the desktop, edit, and type a character in the bat window when done (or it closes itself after the 5 minutes). Not optimal, but not too painful pending improvements in intelligent and/or compliant to the specs syncing. What I don't get in all of this is what is the programming logic. I was a developer for years and know that everything has a trigger. If this happens, do that. So what was the logic behind, as soon as Evernote becomes the active window, start syncing. If, on the rare occasion I went there and didn't find something I expected, I could always click on sync. The logic seems to be, the user want's to do something right now, so let;s prevent that from happening. The logic seems to be, the user want's to do something right now, so let;s prevent that from happening. Either that or the logic doesn't get tested so that there are unintended consequences of the steps that are supposed to work. No excuse for not testing. Which brings me to my current test. I haven't used the web client much. Once I got used to the Win client, it just seemed to different. But now, I'm going to test it for a bit and see what I think. I'm going to start a different thread asking about Windows users experience and preferences on the Windows vs the Web client. Don't exactly remember when, but some "hidden" syncs were added, for currency I think. I noticed one in particular which is a forced push from the server when you email something to your EN account. The note is created in the PC data base independent of sync cycle as far as I can tell. OTOH, since I leave EN open I don't see any syncs when I switch focus to it. There is the setting in Tools - Options - Note - Automatically save edited note every x seconds. I think the default is 30. which will force a sync during most edits. I pushed it to 300. Instant sync seems to ignore the setting, stop typing and an update will occur, but with instant sync off it seems to work fine. Net of it all, it would seem a mapping of the sync capabilities and expected results would help, for those syncs you can control and those you can't. I leave mine open all the time also. But every time I switch to it, and I tested it just now, the sync icon starts spinning.This is before I have edited anything. It may go for a couple of seconds or a couple of minutes. Doesn't matter whether it had focus a few minutes or hours ago. Haven't had instant sync enabled in years. A simple don't sync while active option would solve the problem. I want my other clients to stay up to date, but not while I'm in the middle of typing something. Interesting, wonder why the difference in our systems when swapping focus to EN? Weird. My sync settings FWIW and I don't have context enabled. Mine now, but I've tried pretty much every combination. Don’t know if on demand sync generates any extra syncing (beyond having to go get the note the first time)??? Anyway, turned syncing off other than synchronize changes on exit. Been editing a note and bouncing back and forth between windows and editing some more, still hasn’t synced after 10 minutes. Not detailed science, but seems to be working. Only visible delta is on demand. Makes no sense. Unfortunately, the optimize database trick is only a stopgap. In the first place, I have to do it at least once a week and it takes 3-4 hours. Second, program still hangs, but not during sync as often. Just Not Responding for no apparent reason. Been waiting 5 minutes after cutting and pasting some text into a note. I think I'm going to have to take a hard look at OneNote and Nimbus. This is getting unmanageable. It is sad, really. I was so enamored with Evernote that I almost got my company to try out Evernote Business. Boy am I glad I didn't. The problem isn't that there are bugs (there will always be bugs) but that there are bugs that prevent proper usage, and they aren't patched up right away. All that does is make users lose confidence in the company. I mean we are trusting them with all our data, and we can barely use the program for weeks on end. There is nothing left to do but put up with it while looking for an alternate (and even when it is fixed, our confidence is never what it was). I'm considering just saving files in explorer and relying on search. Or making something myself. I don't want to rely on anyone else anymore. Thank the gods I didn't get my company on board with Evernote. Yes, very disappointed. When they raised the prices, I not only paid, but defended the move on the forums, but I think that was a mistake. Not sure what is going on with the company, but communication has fallen off and that is usually a bad sign. There are weeks when I'm just dumping in docs and don't actively use it, but when I need it, I expect it to work and it is getting worse. I know my experience doesn't mirror some others, but if Need a note and have to wait several minutes each time, or a writing an article and have to stop in the middle to let the system catch up, that's a problem. I'm about halfway moved to Onenote and at this point, don't see a reason to look back. 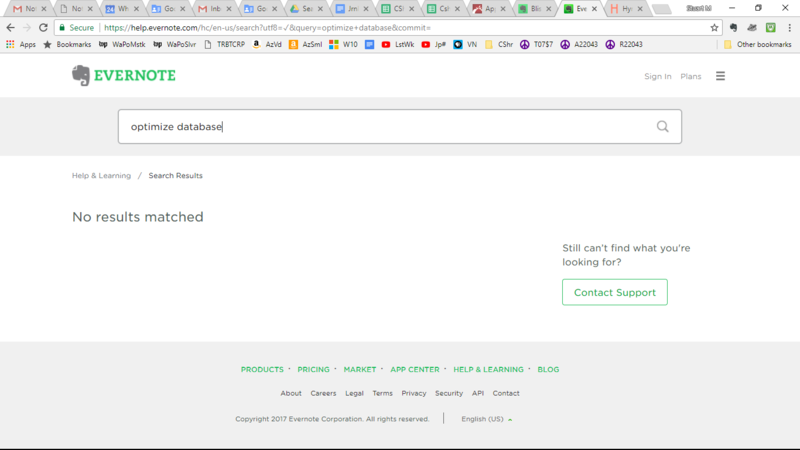 Answering my own question ... searching Evernote for "optimize database" doesn't return any results ... but by searching Google for "how to optimize evernote database w10" I discovered the super secret: While holding down the ctrl key, click on the 'Help' menu. It's not a super secret -- more like an open secret on the forums here -- but it's hidden for a reason: the extra functions exposed in that menu are intended for use in tech support situations. Most people never need any of these operations. In my case, I have only ever used the "Optimize database" function once or twice; mainly just to try them it out when they first appeared. I didn't notice any difference, but then again, I don't have a massive note database as some do, and haven't experienced performance problems to date. In any case, I would never use these functions without having backed up my note database first. Never. And I'm not a casual user. If something goes wrong, then you're really hosed, particularly if you have unsynced notes. So they're hidden to casual users for a reason, and justifiably so, in my opinion. All of that being said, users should also have a backup plan for their notes database anyways. It's just good practice. p.s. I did a search the forum for 'optimize database', and I came up with many hits. Not sure what I did that was different than what you did. Thanks for the reply. I ran the optimization without a backup and it doesn't seem to be any worse but it doesn't seem to be any better. Would have been helpful if there has been a warning to backup the notes before optimizing, but no matter in my case. I have posted a screen shot of my "optimize database" search, prompting me to contact support. Perhaps there is a super secret way to search that I don't know about? I don't consider myself a casual user--I've got 2,500 notes--but my use is low enough that I am able to avail myself of the free service. What brought me here was constant "not responding" messages. Would I get any better performance if I were to pay for the service? First time I ran it, it seemed to help a lot, but about a week later, it was bogging down again. No to the paying part. I have over 15K notes and have been a premium user for years. It may be that support is better, but this is obviously a wide-ranging problem that has been going on for years and from what we can tell, is not being addressed. After messing with the optimization for a few weeks, I put a serious effort into a replacement. For me, the only two that fit the way I work was OneNote and Nimbus. I liked the look and feel of OneNote, but the integration with OneDrive was clunky and difficult. On top of that, the support is Microsoft. If you have ever dealt with their support, I don't need to say more. Nimbus has had a few quirky things that I can't swear isn't user error, but overall has worked very well. The import was very easy and moving notes and folders around has been great. Full disclosure, I am a folder guy, not a tag guy. The folders and subfolder work very good and they are actual subfolders, not like ENs fake 'stacks' The tags I did have seemed to import fine, but I didn't pay any attention to them. The best thing has been the support which has been astonishingly fast. I'm not going to completely dump EN, but will go to the free account before my renewal. OK, I see; you searched the evernote.com site, but I searched the forums. 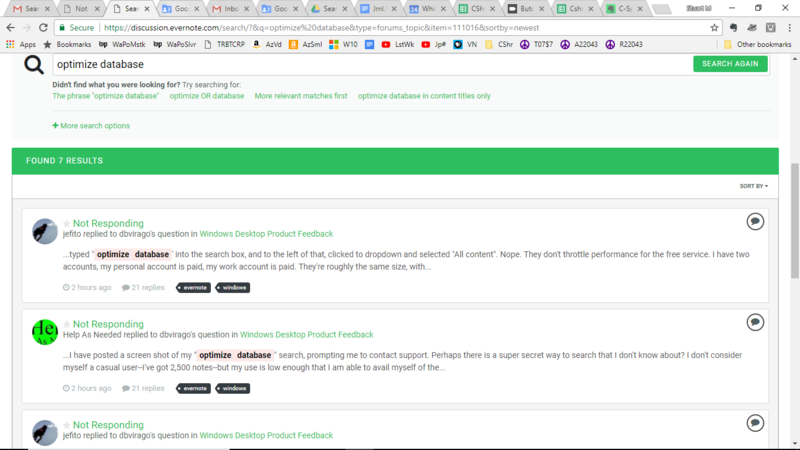 I just went to the top of this topic, typed "optimize database' into the search box, and to the left of that, clicked to dropdown and selected "All content". Nope. They don't throttle performance for the free service. I have two accounts, my personal account is paid, my work account is paid. They're roughly the same size, with some notebooks shared back and forth, running on similar machines. Performance is about the same, though I do keep my database on SSD drives in both cases. I think that the SSD makes a big difference. Beleive me, I understand. I struggled with it for a long time, unwilling to let go of EN. Hope it works out for you. Not to get too far off topic, following your note I (think I) searched the forum and still found only seven results--yours, dbvirago, and mine.